While scantily clad women, pulsating rhythms, and incessant revelry are what first come to mind when you think of the Rio Carnival, the true picture isn’t complete without the Sambadrome, the magnificent stadium designed by world renowned architect Oscar Niemeyer in 1984. 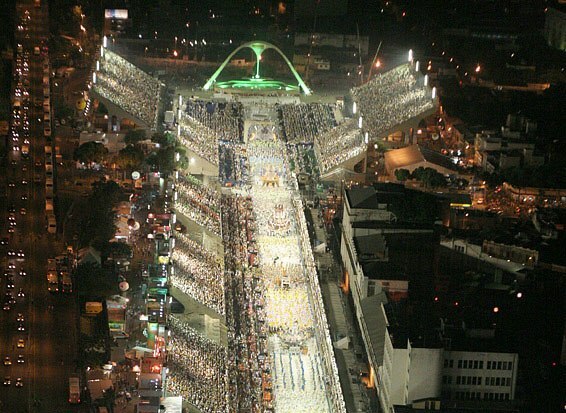 The stadium’s official name is Passarela do Samba Darcy Ribeiro, built in a record 110 days. Prior to the construction of the Sambadrome, the Carnival parades were held on Avenida Presidente Vargas, one of the largest streets in the downtown area. The Sambadrome is divided into sectors with different kinds of seating arrangements. Most of Rio’s who’s who finds their way to the ‘Camarotes’ or mezzanine boxes that are the most expensive in the house. For around US$ 2200, you can be amongst a gathering of international and local celebrities, football players, politicians, and more. Alternatively, several ‘Frisas’ or runway boxes with six seats and a small coffee table are available for around US$ 400-1,900 per seat. These are about the best seats in the house besides the Camarotes. The special seating is not only very comfortable but offers the best views of the Carnival parades. If you can afford it, spend the extra Real or two as this is a “once in a lifetime” event. Comfort and Safety Come First and SecondMuch of the stadium consists of bleachers or grandstand known as Arquibancadas, which present a bigger view of the samba strip. Those without numbered seats are priced lower, but are a great place to be if you want to dance the night away. Each sector in the Sambadrome is well equipped with restrooms, bars, food courts, restaurants, and ice-cream stands. For those planning on joining the spectators in the grandstands, bring a pillow and a raincoat. The pillow provides a soft seat, as the concrete steps can be very uncomfortable. For those who grow weary, the pillow can also be used for quick rest. The weather is subject to change so a raincoat will protect you from the elements. However, neither fatigue nor rain can diminish the power and excitement of the Carnival. 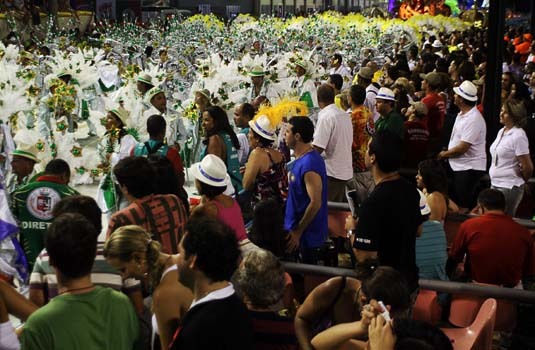 The audience usually stands for hours dancing and singing all night long.In terms of safety, the Sambadrome is considered to be the safest place in South America due to the high presence of security officials and the large number of politicians, royalties, and celebrities.For a closer view of the extravaganza, it would be prudent to carry a pair of binoculars or theater glasses. Some choose to watch only a few schools at the Samba Parade. However, for those healthy enough, experiencing the 12-hour marathon is recommended. For many this could be a once in a lifetime opportunity that is certainly not worth missing for anything else in Rio. On rehearsal days, you can get a preview of what’s to follow on Carnival nights from the grandstands which are open to the public for free. Reliving Samba HistoryTo take a trip down memory lane a visit to the small museum at the Sambadrome located on Rua Marques de Sapucai is a must. The museum has various exhibits that tell the story of the Carnival and samba. Several costumes are also on display at the museum.Plan ahead and get your 2019 Carnival Parade Tickets and Hotel Accommodations Packages to Rio Carnival. Buy your Carnival Parade tickets online, book your hotel accommodations or email our Carnival Help Desk. Guarantee your Tickets NOW.